A little Lord of the Rings trivia to start. When the Fellowship goes to the Elven realm of Lothlorien they are given gifts. Aragorn’s gift was a curved hunting dagger from the first Age of Middle Earth. There are words inscribed on this knife in Elvish. What were they??? I’ll give you a few seconds to think about the answer to that one. 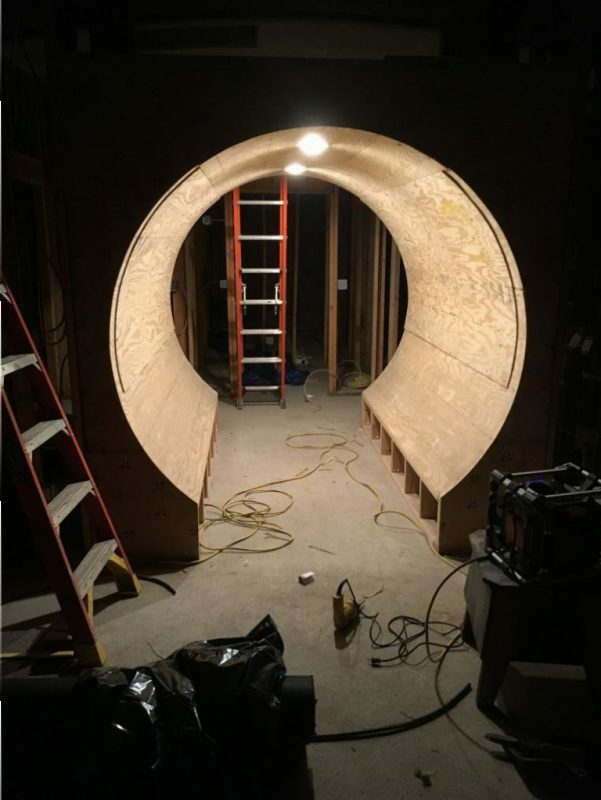 In the meantime welcome friends to another installment of the Hobbit Hollow Construction Blog! Oh yeah, and don’t try to look it up on your phones people. Either you know it or you don’t. Answer: “Foe of Morgoth’s Realm.” I’m actually thinking about putting that inscription over the door to the Hobbit house. It’s really a Silmarillion thing. I’m a huge fan of that book. The history of the Elves essentially, and their battle with Morgoth. (The First Dark Lord of Middle Earth.) If you don’t have a good imagination don’t bother. I’m the only one in my house who has actually finished it. It is a bit dry. There are some really terrific stories in there though and it really shows you the genius of JRR Tolkien. How he wove everything together. The history, races, the blood lines. There are things in the Silmarillion that you’ve seen in other movies as well. Star Wars and the Harry Potter series being the most memorable. He was a visionary. Hmmm. Got a little lost there for a moment. Was thinking about Feanor. The greatest Elf that ever lived. He created the Silmarils. The mightiest works of craft ever made. Ultimately leading to the demise of the Elves. Hmmm again. Let’s get started here before it’s Christmas. Oh yeah. Had to have that Mother-in-Law of mine over for dinner Wednesday. At least she did the cooking. Got to admit she is a good cook. Had the pot roast thing going. Don’t worry I picked up the bill for the groceries. Got to give little old ladies a break. I didn’t know pot roast was so expensive! $50 bucks for a pot roast. I gotta stop by the supermarket and check that price out. Seems kind of high. And there weren’t any leftovers either. You gotta watch these little old ladies. They’re always trying to get over on you. Need I say another word??????????????????????!!!!!!!!!!!!!!!!!!!!!!!!!!!!!!!!!!!!!!!!!!!!!! Like this was some sort of plot just to aggravate me at the end of a long day. And the kicker was, and I not 100% sure of this, I think she had a little old lady grin on her face as she went out the door. That my friends is a true story. The pot roast was awesome though. I really missed eating that blueberry muffin. It was like we were friends. Oh check this picture Ethan took the other day over at the Hobbit. Ethan took this photo of the Hobbit the other day when we had to do a little cleanup. He put it on Instagram. I think the caption was something like,”Stopped by Middle Earth on the way home the other day.” The lighting makes it look good. Anyway upward and onward with Hobbit house construction. Was only able to do a few things this weekend because we went to see Terence on Saturday for parents weekend over at Manhattan College. What a great time we had. We also got to see my nephew Travis run at the Manhattan Invitational Cross Country meet. I believe this is the biggest Cross Country Invitational in the country. It’s a great sport. I ran cross country for three years in high school and ran at this meet as well. It brought back a lot of memories. If you’ve never seen the start of a big race it really is exciting to watch. 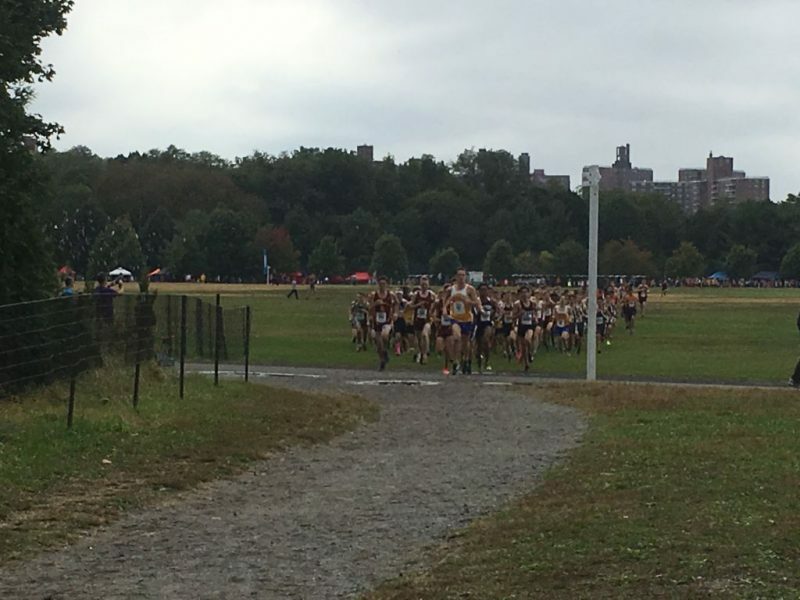 There were about 160 boys in this race from about 20 different schools. There’s one long starting line that everybody lines up on. The starter shoots a gun off and everybody takes off and tries to get in front of the pack before getting into the trails in the woods. It’s right out of the movies. It’s like watching the charge scene in “Braveheart”. Here’s a picture just before they get to the wooded trails. The guys in the front were booking. I mean really booking. So I’m getting pricing on the stonework for the house. Pretty interesting meeting with these guys. I have two prices so far. Looking to get three more. Hopefully I’ll have what I need to make a decision by the end of the week. I also got pricing for the mini split heat pump. A lot higher than I thought it would be. Gotta see if I can whittle them down a bit. Have to make a decision on that as well sometime this week. We’ve got quite a few pots boiling haven’t we. 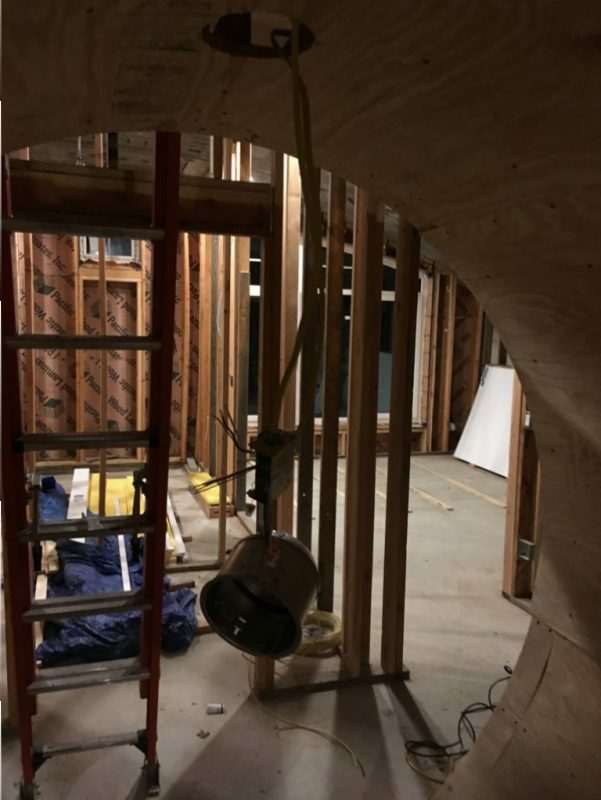 I also got a price on the site work I need done to finish the house off. Not bad. Pretty much what I expected. To set up for the mini split heat pump installation I have to finish wiring the high hats over the hallway and plywood over the area over the hallway so that they can mount the unit to the wall. There’s a number of other things I need to do which I’m going to finish next weekend by hook or by crook. If you remember I used renovation style hi-hats in the hallway. So I pulled them out of the ceiling and wired them from below. Can’t really see much there. Oh well. I set up two switches for these lights so that you can turn them on and off from either side of the hallway. It’s always nice when the lights work the way they’re supposed to. Hope to hit it hard so to speak next weekend. I really want to get everything ready for these other guys to come and get their work done. On a different note, check this out. 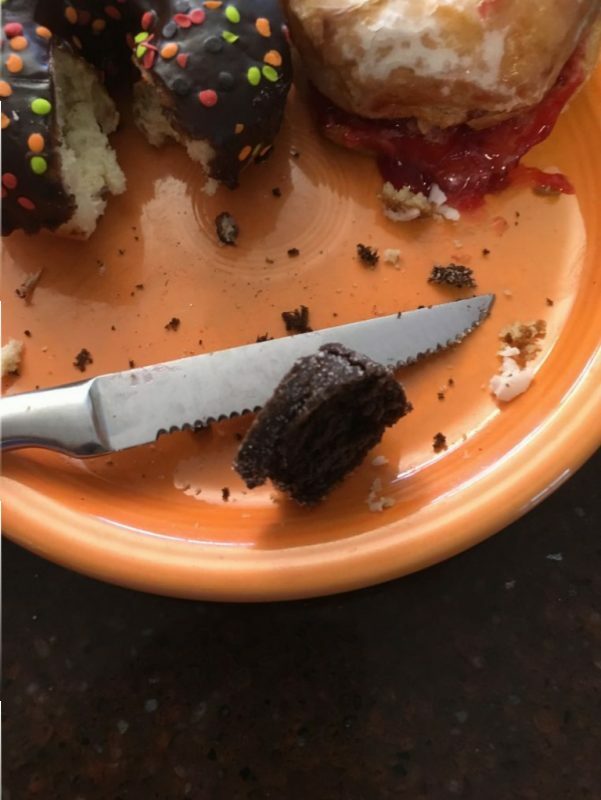 Piece of donut left behind by the Editor. I mean really? Who are we kidding with that one? I’m amazed also that both are still coaching and Arlington does very well each season. 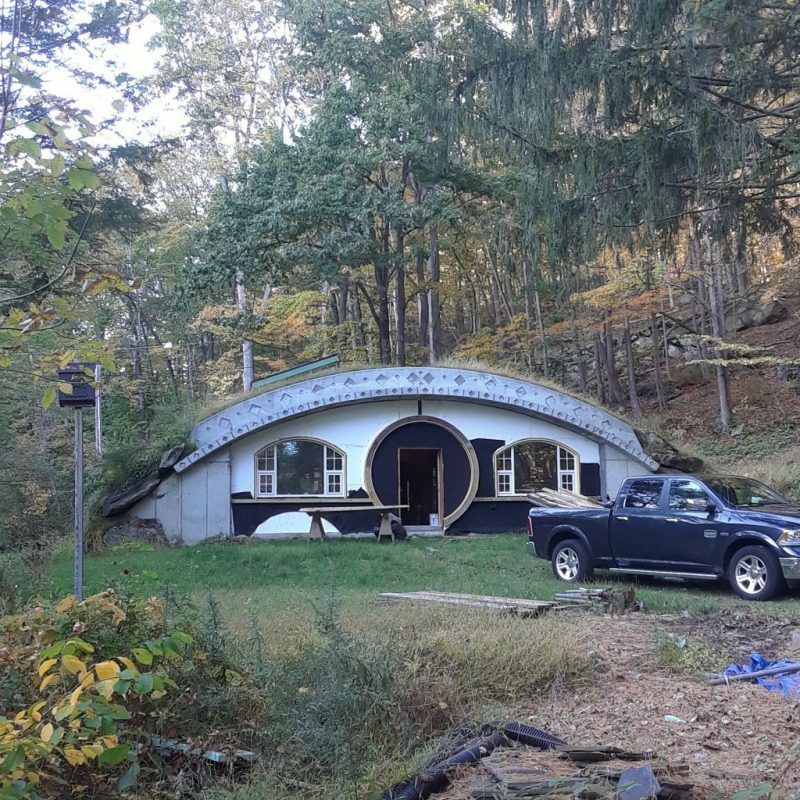 I came up north for the Fall Semester and trying to visit Hobbit Hollow. I teach every other Saturday (plus every Mon through Thurs) here in Brooklyn. It’s been a busy semester! Are you in New Jersey Mike? Where are you staying? Are you renting? I’m busy this Saturday but thereafter I’m available. Let me know when it’s a good time for you. We’ll have lunch at McKinney and Doyle. My treat. Glad you enjoyed the pot roast,you sure ate enough,I had to hide some so Ethan could have seconds or maybe thirds. Ont thing I’ll tell you us little old ladys on S.S. love when we can get $50 for a $15 dollar pot roast.As for the muffin I really enjoyed it,one more for the little old lady who left with the muffin. See you wed.Chicken Parm and spaghetti with home made bread,how much for that at least $25. I want an itemized receipt for the works! Or the deal is off. And what happend to dessert? That’s part of the deal too. Oh and another thing. No more coffee cake. You just get one shot at the dessert and that’s it. That last coffee cake you made I used for mortar in the rock wall over at the Hobbit!!! See you Wednesday and don’t forget those receipts! Very nice! Glad you got to see Van Cortland & the Invitational again. Mr. C (Scarsdale) and Arnett (Arlington) were probably there also…both still coaching!! Wow! That’s amazing. Mr. C, I can’t believe he’s still doing the coaching gig. Pretty remarkable. That would have been weird bumping into him down there. Never would have expected that. How old is he? He’s got to be in his mid sixties right? It was nice watching the race. You forget how intense it is. I couldn’t talk my kids into running. They thought the race was cool though. Nice hearing from you Mike. I hope all is well.